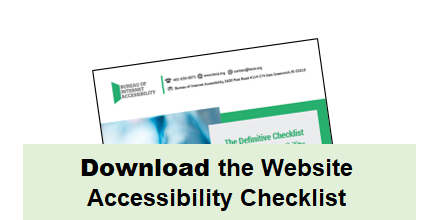 This in-depth checklist will assist you with the basic guidelines for complying with the website accessibility standard, the Web Content Accessibility Guidelines (WCAG) 2.0 A/AA. The criteria for successfully meeting each guideline is more easily achieved when considered during a website’s design process, but even if you did not account for accessibility measures while developing your site, you can still make changes that will increase overall usability of your digital presence and make it available to a larger audience. Website accessibility is an important investment in your infrastructure and in setting organizational accessibility policies, and providing an inclusive environment online and offline. The WCAG guidelines outlined on this checklist, when followed, can provide a baseline for making your content more accessible to users with disabilities. Users who do not have disabilities will also benefit from the changes in design that provide a better user experience and give them more options for navigating the website and accessing content.